For seventy-five years the National Model Railroad Association has been the oversight organization for model railroaders in the United States. It has provided standards and recommendations for the construction and operation of model railroad equipment in many different 'scales' including standard gauge O scale. Included in the NMRA Standards and Recommended Practices are dimensions for wheel profiles and gauging, which until very recently had become outdated. The NMRA had provided dimensional specifications that provided for models that had a very unscale appearance and this left many builders of equipment following their own practices in search of more visually acceptable models. Dissatisfied with the standards provided by the NMRA, Kohs & Company has for more than twenty years utilized the same proprietary standard that provided for a more scale appearance for the models we produced, dating back to those produced under the Fine Art Models name for Lionel trains. This proprietary standard was developed for use on standard gauge O scale track without modification and requiring only reasonable attention to track work construction practices also provided by the NMRA. 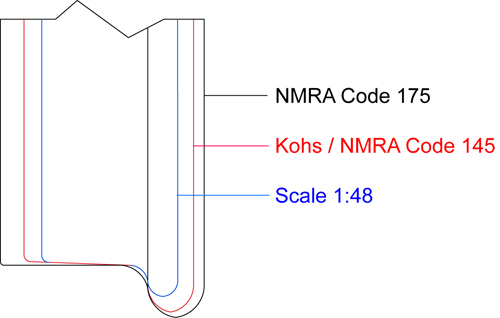 The illustration below provides a direct comparison of the long held standard wheel profile provided by the NMRA (prior to February 2010) and that used by Kohs & Company for our models. While we have had little concern for the profile and gauging standards provided by the NMRA, the use of their recommended gauging tool has also been of little value with our models. While our standards have provided for a far more scale overall appearance, they have also been backed by a Limited Lifetime Warranty for original owners to provide assurance that Kohs & Company design standards were intended to be compatible with NMRA Standards and Recommended Practices for standard gauge O scale trackwork. Until late in 2009 this had been the situation, but the NMRA has now revised it's RP-25 document, adopting new dimensions for standard gauge O scale wheel profiles. By way of comparison, the old standard is represented by the black outline above and the new standard is represented by the red outline. In essence, the NMRA adopted essentially the same dimensions that Kohs & Company has used for more than twenty years. This has certainly simplified the discussion going forward except that the NMRA has also adopted new gauging standards which are contrary to what we have found to be effective on the thousands of models we have produced to date. Our proprietary wheel profiles have been a unique characteristic of Kohs & Company models and they have allowed us to move away from the most common O scale design compromises in driver diameter and valvegear arrangement. To stay a step ahead in design, now that the NMRA Standards and Recommended Practices have caught up with where we have been for years, it is time for Kohs & Company to push forward. The final phase of our profile/gauging development will include the use of scale wheel profiles. The illustration below provides a direct comparison of the three defined dimension sets relative to standard gauge O scale modeling. The code 175 represents the old NMRA RP-25 recommended practice and the code 145 represents the newly revised RP-25 recommended practice as well as our original standard. The Scale 1:48 outline represents scale dimensions, which is the focus of our development. As we have worked through the testing process with scale profiles we have not experienced any difference in operational reliability from that experienced over the past twenty years. Testing has been conducted on every type of track imaginable, from common types of flex-track to hand-laid rail. The bottom line has been, if the trackwork has been built to the Standards and Recommended Practices, the operation has been trouble free. Just as with our original standards, if there is an element of the trackwork not up to specification, the more prototypical model will find it quicker than the models built to old standards. It stands to reason that if you remove the compromises in model construction it will be less forgiving of mistakes in trackwork. It does need to be understood that, just as with our original standards, our gauging standards are different than those recommended by the NMRA to provide for better performance. There have been two by-products resulting from our scale profile development; we have learned a great deal about the modeling practices and experiences of hands-on modelers around the country and with wheel profiles that mirror those of P:48 modelers, we will be in a better position to support that segment of the hobby. The lessons learned from our development experiences and information regarding our wheelsets with adjustable gauging for P:48 will be shared on dedicated technical pages, notice will be given on our general update page when they become available.